Definitely dating myself a bit here as I'm sure you younger gals don't remember the Ruffles potato chip commercial with the little boy going "rrrr ruffles, have rrrrr ridges." Heck, I think it was already in pretty old rotation when I was a kid, but I do remember it! Anyway, why am I talking about ruffles having ridges? Just because I'm all sorts of ruffle-y today! I got this shirt at the same little vintage shop I bought that whimsical denim shirt at. I've been all over pretty girly things like this lately, so I just had to have it. I thought it would look nice with my maxi denim skirt that sort of feels ruffle like and of course I'm back to my Gussy bag since it's all full of ruffles too. So I'm just triple the ruffle-y fun today! So if you watched my little video yesterday - first of all thank you for indulging me in something a little different. 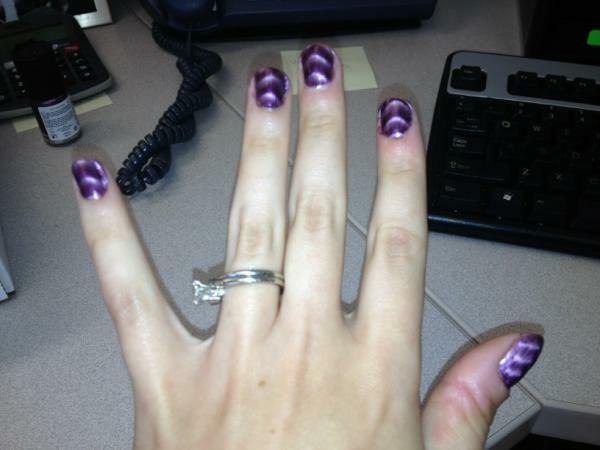 Secondly, below is the result of the nail polish I was talking about. If you missed the video, I'm testing out the Sally Hansen Magnetic Nail Color for Influenster. They provided me with the nail polish in the color of Polar Purple. I have to say - I LOVE it. It was so easy to use, unlike some of the other Sally Nail Art products. You apply two coats and hold this little magnet over your nail for 10 seconds - and this is how it turns out. Pretty neat huh? It's recommended after it drys to put a clear top coat on, which I didn't do, so I'm sure this won't last long, but I'll enjoy it while it does. I would love to get another color of this stuff. It's fun and again, I can't stress how easy it is! Onward to the weekend! Here in MN we're finally getting some relief from the heat wave. I cannot wait. Have a great weekend everyone! Influenster provided me with the Sally Hansen nail color free of charge for testing purposes - review and opinion are strictly my own. Beth, one can never have too many ruffles! I absolutely am in LOVE with anything ruffly! So this outfit is a definite YES YES YES! Your ruffle top is so cute! I do remember that Ruffles commercial too. I've seen that magnetic polish in stores and I was really curious how it would turn out, thanks for the review. :) Have a great weekend, Beth! i've always thought that the 4th should be celebrated on a friday, because then you don't have to go to work the next day....OR they could make it mandatory that we also have the 5th off! Rrrrrr ruffles :D I love that nail polish! Brilliant idea about changing Independence day to the first July Monday! This week was so weird! How crazy is that nail varnish! The ruffles are good!!!! Your ruffled top is pretty. I have one (not the one I wore today) that looks very similar in style, but different colors. I got on a sleeveless top kick a few months back and thrifted several. haha Oh, and love the purse too. And....you gave me the urge to buy nail polish in yesterdays video. I didn't get cool stuff like you, but I bought 6 bottles that were on sale for only $1.50 each. Four of them are in colors that are very similar and would have matched the shirt I wore today. I'm going to try one out now. I don't know why I bought it. I get on nail polish kicks every once in a while too....and then never wear it because it's just too much trouble. Ha! Triple the ruffley fun- I love this Beth! That maxi skirt is so fun and different. Have a great weekend! The ruffled top is just so adorable and fun! I definitely remember that Ruffles slogan. You look so cute, love that polka-dot tote!